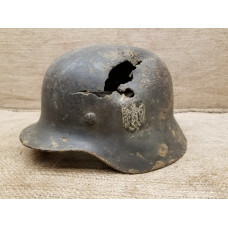 Up for sale Wehrmacht combat helmet with bullets wounds through.Double decal, size 62 model M 40. 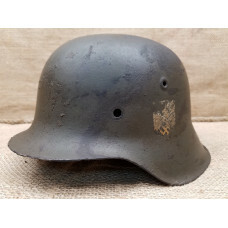 St..
Up for sale original Wehrmacht combat helmet M 35 model signed.Great relic helmet, certainly w..
Up for sale German combat helmet M 40 model Size 64. Signed twice ! 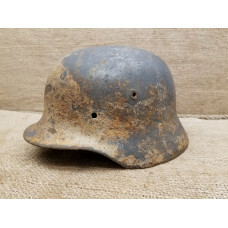 Chemical pencil on leather ..
Up for sale battle damaged german WWII relic helmet shell model M 40.Ground dug condition, a lot of ..
Up for sale nice looking WWII- relic German combat helmet model M 40. 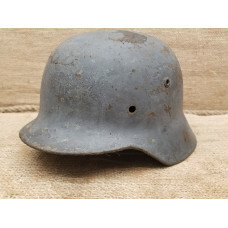 Close to perfect deep bog..
Up for sale WWII German troops helmet M42 model.Strong metal ground dug found condition, lot o..
Up for sale Grman WWII helmet M42 model size 68.Originally signed by soldier "Holtmann".Nice s..
NIce ground dug relic helmet shell M42 Size 64WH decal well preserved , many original paint.&n..
Up for slae very nice preserved ground dug helmet M 40 model size 64.Strong metal , has small crack ..
Up for sale original WWII German navy - Kriegsmarine helmet shell. Quite good underwater deep m..
Up for sale luftwaffe breadbag strap. 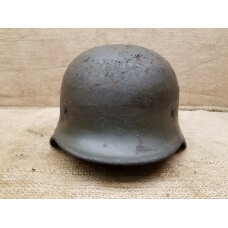 Helmet not included in this sale.Nice markings, check how It w..
Up for sale original original WWII period Luftwaffe helmet shell.Model M40, size 64, lot of original..
Up for sale original WWII battlefield relic - M 35 helmet size 64. Excellent bog found conditio..
Up for sale quite nice looking M 35 WH SD helmet shell size 62.Mostly original paint remained, WH de..